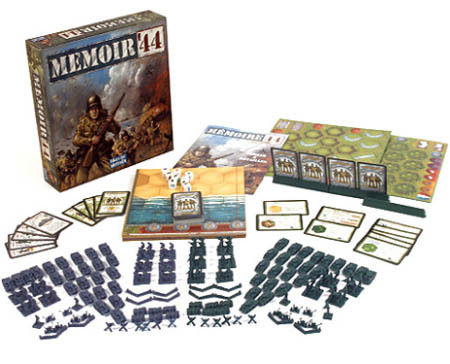 The object of the game is to be the first to win a set number of Victory Medals (usually 4 to 6, depending on the selected battle scenario's victory conditions). 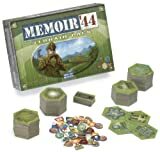 In Memoir '44, a Victory Medal is gained for each enemy unit entirely eliminated from the battlefield. Each Medal won is designated by placing the last figure of the eliminated unit on any of the available Medal Stands located on your bottom left edge of the board. In some scenarios, additional Medals may be gained from the board map itself, for capturing and holding certain terrain hexes or battlefield objectives. We strongly recommend that you follow the step-by-step approach outlined below when setting up a game, especially for your first few plays. Select a battle from the scenario section of this booklet. Place the board in the center of the table, with the proper face (countryside or beach landing) visible. 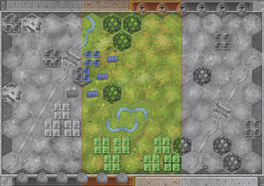 Place the necessary Terrain hexes, as indicated by the battle scenario. Add the fixed (Bunkers and Bridges) and removable Obstacles, if any. Now place the figures on the board, matching the various units' positions to the scenario's battle map. Experience shows that dropping one figure per hex, for positioning purposes, then filling up the units as required, is the quickest way to set up. An Artillery unit is usually made of 2 figures, an Armor unit - 3 and an Infantry unit - 4. Add the Special Unit badges to individual units and Victory Medals to specific, on-the-map objectives, if required per the scenario's special rules. For Pegasus Bridge, place an Allied victory medal on each bridge. 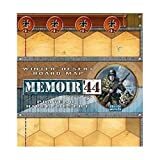 Place the Terrain summary cards that correspond to the terrain in the scenario (Wood, Towns & Villages and Rivers summary cards for Pegasus Bridge), plus the Obstacle and Units summary cards, to the board's side, for in-game reference. Assemble the cardholder segments and place them on the board map's edges. The card holders are not necessary, but are particularly useful when playing in teams of multiple players to a side, or in a classroom/demonstration environment. With them, players on a same side can point to and study various options. Now choose each player's side and sit in front of the board accordingly. Given the relatively short duration of a typical battle scenario, we recommend match play, with each player taking first one side, then the other in an immediate re-match. This helps balance any historical advantage that one side may have in a particular scenario. The winner of the match is the player who scores the most Victory Medals after both battles. Shuffle the Command cards deck thoroughly, and deal Command cards to each side per the selected scenario's briefing notes. Place those cards in your respective cardholder, keeping them secret from the opposing player. Place the remainder of the deck face down, alongside the board's battlefield, within easy reach of both players. Each side takes four Battle dice. The starting player, as indicated in the scenario's briefing notes, begins play. 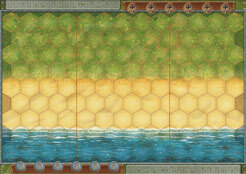 Battles are fought over a hexagonal game board 13 hexes wide by 9 hexes deep. The battlefield is divided into three sections by two red dotted lines, giving each player a left flank, a center and a right flank section. Where a dotted line cuts through a hex, the hex is considered to be a part of both the flank and center section. Section cards are used to order a move and/or battle in a specific section. These cards indicate in which section(s) of the battlefield you may order units and how many units you may order. Tactic cards allow you to make special moves, battle in a specific way or take special actions, as explained on the card. Some cards allow you to order troops in just one section, while others order units in all sections. The player listed in the briefing notes goes first. Players then alternate taking turns, until one of the players reaches the number of Victory Medals indicated in the scenario's victory conditions. At the start of your turn, play one Command card from your hand. Place it face up in front of you, and read it aloud. Command cards are normally used to order units to move and/or battle. The card you play will indicate in which section(s) of the battlefield you may issue orders, and how many units you may order. After playing a command card, announce which corresponding unit(s) you choose to order. Only those units that are issued an order may move, battle, or take a special action, later in the turn. Units on a hex with a red dotted line running through it may be ordered from either section. You may not give more than one order to each unit. If the Command card allows you to issue more orders in a given section of the battlefield than you have units in that section, those additional orders are lost. Movements are announced and made sequentially, one ordered unit at a time, in the sequence of your choice. A unit may only move once per turn. A unit that is ordered does not have to move. You must complete one unit's movement before beginning another. In addition, you must complete all unit movements before proceeding to Battle (step 4). Two units may not occupy the same hex. When moving a unit, you may not move onto or through a hex occupied by a friendly or enemy unit. You may not split off individual figures from a unit; they must stay together and always move as a group. Units that are reduced through casualties may not combine with other units. Some terrain features affect movement and may prevent a unit from moving its full distance or battle. An ordered Infantry unit may move up to 1 hex and battle or 2 hexes and not battle. An ordered Armor unit may move up to 3 hexes and battle. An ordered Artillery unit may move 1 hex or battle. Battles are checked and resolved sequentially, one ordered unit at a time, in the sequence of your choice. You must announce and resolve one unit's battle entirely before beginning the next one. A unit may only battle once per turn. A unit that is ordered does not have to battle. A unit may not split its Battle dice between several enemy targets. The number of casualties a unit has suffered does not affect the number of Battle dice it will roll in combat. A unit with a single figure left retains the same firepower as a unit at full strength. A unit attacking an adjacent enemy unit is said to be in "Close Assault" with that enemy. A unit attacking an enemy unit more than 1 hex away is said to "Fire" at that enemy. A unit adjacent to an enemy unit must Close Assault this unit if it chooses to battle. It may not fire on another, more distant, enemy unit instead. After resolving all hits and retreats, discard the Command card played and draw another card from the deck. Your turn is now over. If the draw deck runs out of cards, the discards are shuffled to form a new draw deck. Announce the ordered unit you want to attack with, and its target. b. Check Line of Sight (Infantry and Armor only): verify that your target is within line of sight. Count down the number of Battle dice to roll, based on the type of unit you're attacking with and its distance to target. Determine terrain Battle dice reduction, if any. Reduce the number of Battle dice rolled accordingly. Resolve Battle: Roll Battle dice and resolve resulting dice rolls. An ordered Infantry unit may battle any enemy target unit 3 or fewer hexes away. It rolls 3 dice in close assault (enemy on adjacent hex), 2 dice against a target at 2 hexes, and 1 die against a target at 3 hexes. To determine the number of Battle dice to roll, simply "count down" the number of dice rolled: Position your finger on the first hex adjacent to your unit and move it, one hex at a time, in the direction of the target, counting down ("3", "2", "1") as you reach new hexes. The last number you pronounce when your finger reaches the target is the number of dice you should roll. An ordered Armor unit may battle any enemy target unit 3 or fewer hexes away. It always combats at 3 dice. An ordered Artillery unit may battle any enemy target unit 6 or fewer hexes away. It combats at 3,3,2,2,1,1 as illustrated on the right. To battle, an Infantry or Armor unit must be able to "see" the enemy unit it wants to target. This is known as having "line of sight". An Artillery unit does not require line of sight to target an enemy unit. Imagine a line drawn from the center of the hex containing the battling unit to the center of the hex containing the enemy target. The line of sight is considered blocked if any hex (or part of a hex) intercepting this imaginary line segment contains an obstruction. Obstructions include units (friends or foes) or certain type of terrain features. The terrain in the target hex does not block line of sight. When the imaginary line runs along the edge of one or several hexes which contain obstructions, the line of sight is not blocked, unless the obstructions stand somewhere along both sides of the line segment. Each type of terrain and obstacle is described in the Terrain and Obstacles section (Appendix 2, p 13). Please refer to that section or the corresponding summary cards, and deduct any potential terrain Battle dice reduction from the number of dice to be rolled in the attack. Hits are resolved first, followed by retreats. In battle, the attacker scores 1 hit for each dice symbol rolled that matches the unit type targeted. Each Grenade rolled is also 1 hit. For each hit scored, 1 figure is removed from the target unit. When the last piece in the opponent's unit is removed, place it on top of one of the empty Medal Stands on your side of the battlefield. If an attacking player rolls more hits than the number of figures in the defending unit, these additional hits have no effect. unit must always retreat toward its controlling player's side of the board. Terrain has no effect on retreat moves, therefore a retreating unit may move through a forest or village without stopping. However, impassable terrain may not be moved through during a retreat move. A unit may not retreat onto, or through, a hex already containing another unit (regardless if friend or foe). 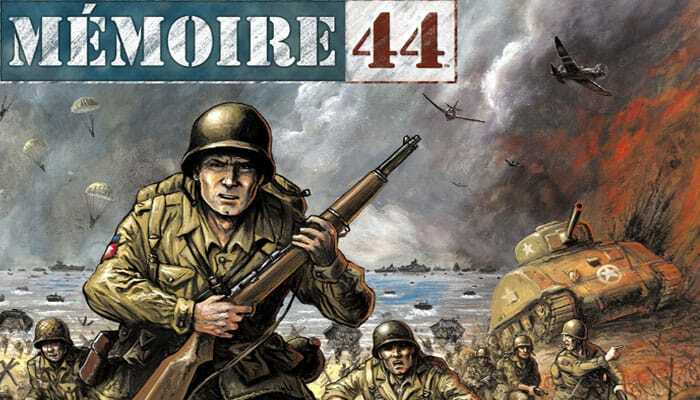 If a unit cannot retreat; is forced to retreat off the limits of the battlefield; or would be pushed back onto a sea hex, one figure must be removed from the unit for each retreat move that cannot be completed. Some obstacles will allow certain units to ignore the first flag rolled against them. When an ordered Infantry unit in Close Assault combat eliminates the enemy unit or forces it to retreat, it may Take Ground by advancing into the vacated hex. An Artillery unit may not take ground. Terrain movement and battle restrictions still apply when units take ground. When an ordered Armor unit in Close Assault combat eliminates the enemy unit or forces it to retreat, it may take the ground by advancing into the vacated hex and claim an Armor Overrun combat. On a successful Close Assault Combat, an ordered Armor unit may move into the vacated hex and may then battle again. If the ground you take during the Overrun puts you adjacent to an enemy unit, this second battle must once again be a Close Assault Combat. Otherwise, you may fire at a distant unit. A unit may Take Ground again after a successful Overrun Combat. However, an Armor unit may only make one Overrun Combat during a turn. All Battles, Close Assault and Overrun Combats must be completed before the next unit may battle.